What candy do you think of first when it comes to Easter time? The odds are good that it's a package of neon-colored Peeps marshmallow candy from Just Born! And for good reason. These adorable little sugary marshmallows have been around for ages, delighting both children and adults. This Easter, Blair Candy has the classic packages of brightly colored chicks and bunnies that everyone knows and loves. Also, try the large bunny Easter Peeps, which are absolutely charming and will make a great addition to any Easter basket! Maybe what we love most about candy in general is just how diverse it all is. You can get your hard Easter Pez or, if you're not feeling much up to a crunch today, go with some melt-in-your-mouth Peeps candy! No one's going to blame you! 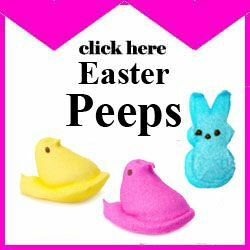 Visit our Easter candy page to see Easter Peeps and much more Easter candy in bulk!